It is on every map, nowadays, that Düsseldorf is the German capital of antitrust, yet there still is this competitor on the European level. 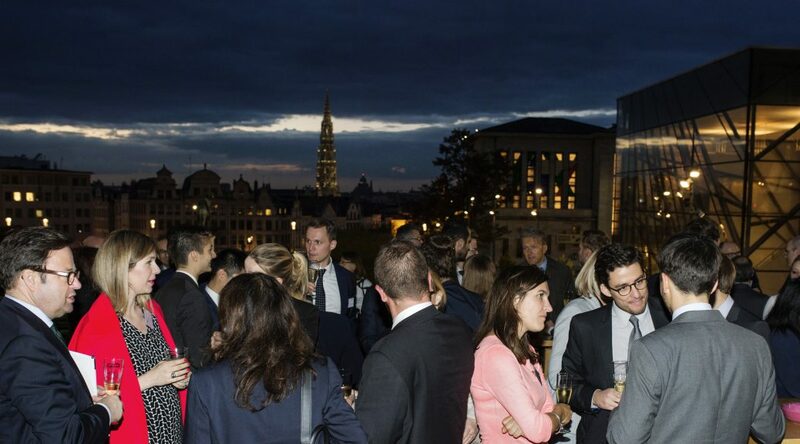 So, the Düsseldorf Institute for Competition Law went to Brussels to host the EU Competition Conference 2017, together with CMS, the law firm – and of course, to engage in Brussels talk. Rupprecht Podszun reports from the European capital of antitrust on fairness, Intel, economics, platform bans and damage claims. When Johannes Laitenberger, the Director-General, neared the end of his speech he took a deep breath and dived deeply into literature when quoting the Italian writer Italo Calvino. Calvino had been a member of the Resistenza, a Communist (up to 1957, when, presumably, he was convinced of the market economy through the Treaty of Rome), and a dreamer, of sorts. 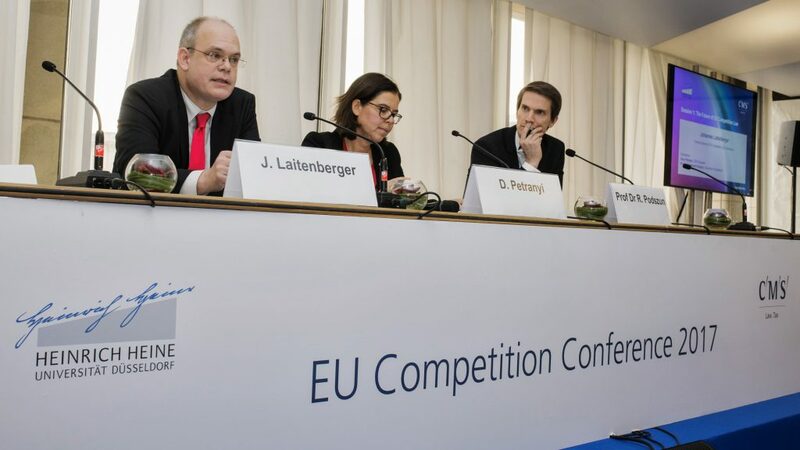 Laitenberger spoke about the future of EU competition law, and he took comfort in quoting a poet. 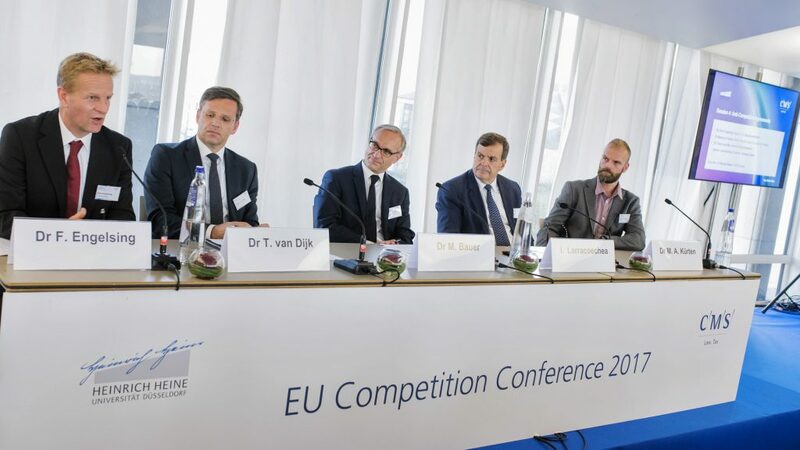 The DG discusses the future of EU Competition Law. This seems characteristic for a tone that struck me in recent weeks: The Commissioner and the Director-General talked a lot about fairness, a poetic term. Or, how Theon van Dijk from ECA put it: “As an economist, I cannot handle the term fairness.” Is fairness, taking resort to Italian poets, the answer to the Intel judgment? After all, with this judgment, the Commission found out that the effects-based approach may have its price. The comfortable position of doing economics to a degree that the parties to the case were happy while being relatively free from court control has come to an end. It seems to be a nice exit-strategy to move back from effects to more elusive narratives like protecting “fair” competition. 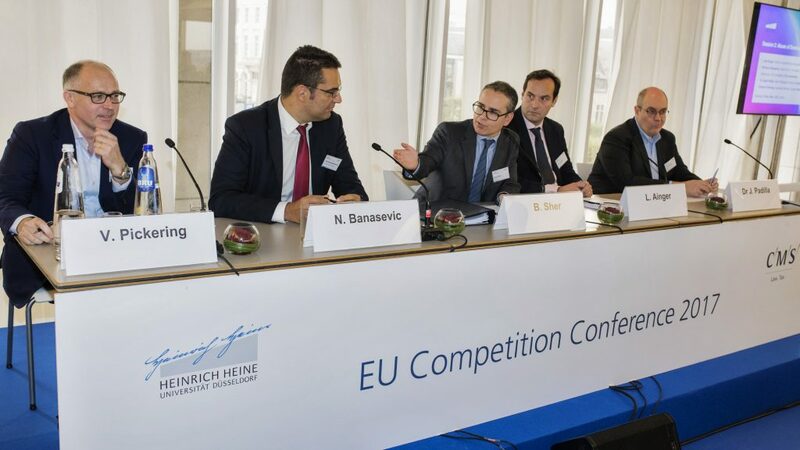 Nic Banasevic, the Commission Head of Unit who oversees IT cases like Google, said that fairness and the effects-based approach perfectly fit together. Fairness, Laitenberger again, is part of “the bigger story” while the effects-based approach that – according to Banasevic – characterises the Google Shopping decision is probably to be read as the poésie concrète of competition law application. Still now, a couple of weeks after the Intel judgement, this case seems to be talk of the town (apart from, maybe, the question whether Günther Oettinger will return to Germany to become Minister of Economic Affairs – the answer is “not yet”). Economists seem thrilled that “the as-efficient-competitor-test is back” while lawyers read the judgment with some more hesitation. In a gripping panel on abuse, Jorge Padilla from Compass Lexecon, compared this test to democracy: It’s not optimal, but it’s the best we have. 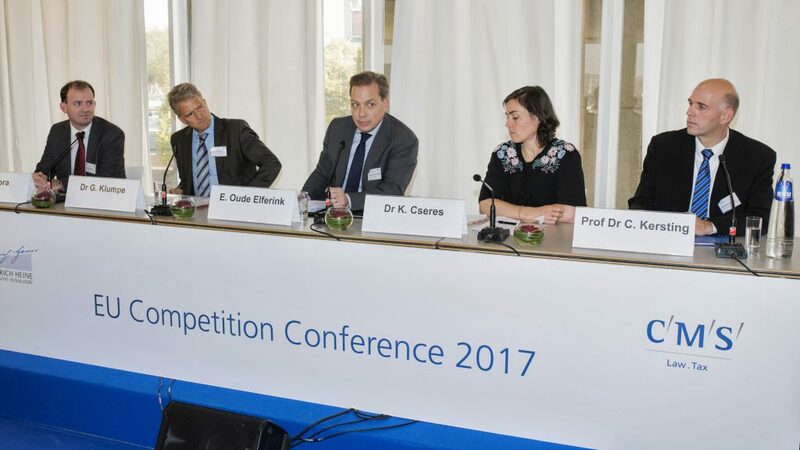 Some panellists, however, questioned what the “as efficient competitor test” actually entails. And Vincent Pickering of Spotify argued that enforcement does not work quickly enough. On this matter, Johannes Laitenberger had called his Commissioner a champion of the principle “Justice delayed is justice denied”. Talking about the digital economy: Padilla made a comment when discussing Google that I found interesting: Lawyers, he said, put labels on economic tests. And then they start sorting cases into the boxes with the labels. Yet, as an economist it strikes him (so I understood Padilla) that these tests have very different standards. If your case lands in the box labelled “tying” you are pretty soon acting abusively. If your case gets the refusal to deal label, you will probably get away with it. Is the Commission operating with double standards? An economist asked me why the German handling of economics at the Bundeskartellamt did not meet the Brussels (single or double?) standards, at least sometimes. Some people I spoke to agreed that things have been improved a lot at the Bundeskartellamt in this regard. Handling of cases at the Bundeskartellamt has two institutional contingencies that are different from Brussels: It is controlled by the courts, and in my view to a higher degree than the Commission. So, the first reason is that the Bundeskartellamt simply follows the line of the courts in this area. Secondly, the Decision Divisions in Bonn decide independently. It is a decentralised organisation that is not comparable to the complex hierarchy in DG COMP. Andreas Mundt is not in the position to dictate a decision, and no other departments have to be consulted before the committee of three takes a decision like judges on the bench. I see independence as the noblest feature of the Bundeskartellamt’s organisation, but it comes at the cost that individual case-handlers may not meet your taste. A panel on damage claims tried to figure out what has changed, now that the Directive is implemented in 23 out of 28 Member States. Edmon Oude Elferink of CMS said dryly that in the Netherlands basically nothing changed. Gerhard Klumpe, an influential damages judge from the District Court of Dortmund in Germany, gave a first-hand account of what happened at his court. According to Judge Klumpe only 5-6 cases of discovery are pending at his court. Most of these stand-alone claims for information had been brought by defendants (!) in cartel cases. When discussing this newly introduced tool for disclosure of information we were concerned that U.S. style fishing expeditions may start in Germany. Yet, these concerns may have been exaggerated. Where do claimants turn to, now that Germany has a tool on offer that is less attractive than expected, the Netherlands have not done much, and Britain is on its way out? To Hungary, where there is a damages presumption of ten percent? Our very own Professor Christian Kersting tried to convince people of his view that the notion of undertaking needs to be the same in damage claims as in fining. Some people in the audience did not like that very much and everyone tried hard to read the mimics of Judge Klumpe who would be in the position to bring this question to the Court of Justice. In another panel, anti-competitive agreements came on the table. 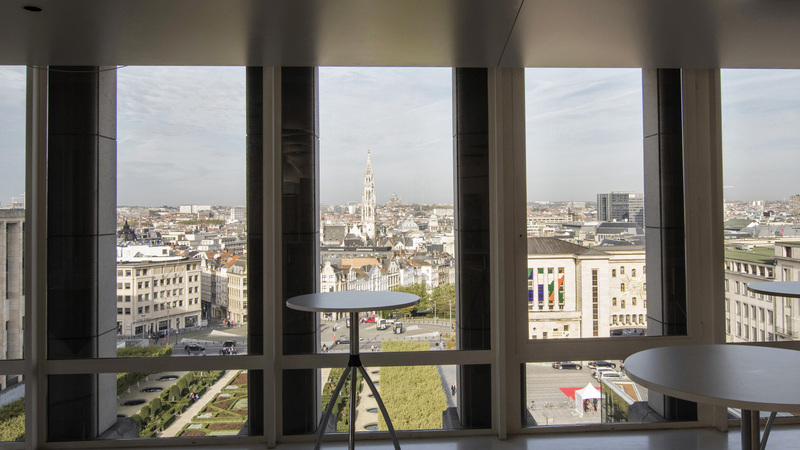 Everyone is Brussels is of course waiting for the Coty judgment of the Court on platform bans in selective distribution agreements (the opinion of the Advocate General is out already and has been commented on here and here). In the meantime, trying to pick on the pioneering German approach in this regard seems to be a good sport. Felix Engelsing from the Bundeskartellamt was grilled by Markus Kürten from Adidas and moderator Michael Bauer in a way that usually goes the other way round: Enforcers grilling company representatives. They tried to find out whether Engelsing sticks with the strict approach of his predecessors regarding the ban of online platforms, RPM and other consumer goods topics. In his answers, Engelsing displayed an EU-style ability to answer questions elegantly, not deviating a iota from the authority’s line, but still leaving some room for interpretation. This is of course a reference to the master of this art, Johannes Laitenberger. Speaking of whom, brings me back to that Calvino quote. Laitenberger said (in the words of Calvino) that we may only expect from the new millennium what we ourselves make out of it. I tried to relate that to his earlier comments on how we can cope with algorithms or artificial intelligence. Could he possibly have meant that “the bigger story” is still the story of the individual responsible for its actions? Competition as the ultimate mechanism to coordinate human, not machine-driven actions? He left room for interpretation and instead gave us a new catchword that will probably keep us busy for a while. He said that Commissioner Vestager likes the idea of “antitrust compliance by design”, a term she used (as far as I know) at the International Cartel Conference for the first time. (Simonetta Vezzoso gave an idea on competition by design in her Ascola talk). Felix Engelsing mentioned that the Bundeskartellamt employs more and more mathematicians and IT experts. We look forward to that competition of authorities!